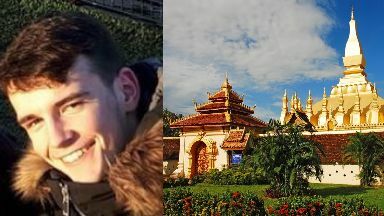 Andy Towns, 18, from Edinburgh was knocked down by the vehicle in Southeast Asia. A teenager from Edinburgh has died after being knocked down by a minibus in Southeast Asia. It is understood that Andy Towns, 18, was on a gap year when he was struck by the vehicle in Laos on Saturday. A spokesperson from the Foreign and Commonwealth Office confirmed the incident. They said: "Our staff are offering advice and support to the family of a British man following his death in Laos, and are in contact with the local authorities regarding the incident." Following his death, tributes were paid online to the former Boroughmuir High School pupil. Boroughmuir Seniors tweeted: "Absolutely heartbroken. Andy Towns, one in a million, you'll never be forgotten. Rest easy brother." A minute silence was also held by his former club, North Merchiston FC Blacks. On Saturday, the club tweeted: "The club is devastated to hear the loss of 18-year-old Andy Towns. "Andy was at the club for a number of seasons and will be sorely missed by all at the club. "All NMFC teams will observe one minute of silence at tomorrow's games."